Of course, as with all events, a questline comes with it to help move us through the ins and outs of the event…and unlock all of the prizes. As was mentioned on the rundown post this mini event is similar to the previous mini-events (like Homer the Heretic and the Most Dangerous Game before it), in that you’ve got to complete various tasks to unlock the prizes. And that’s it my friends! Another one in the books…. What are your thoughts on the Mini Event? 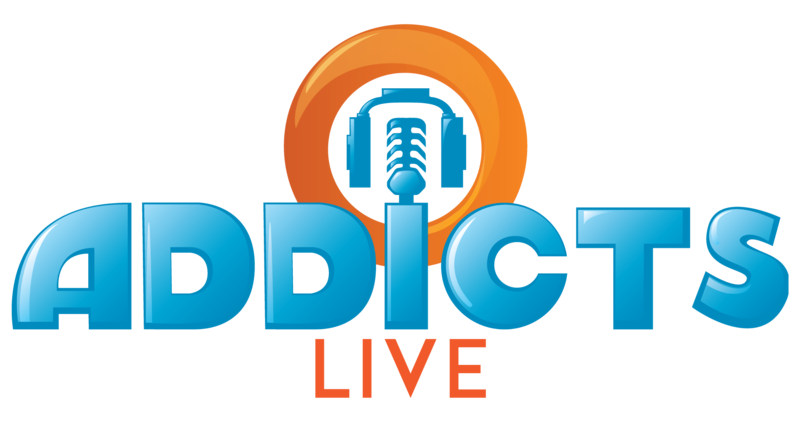 Any prizes you’re looking forward to getting? 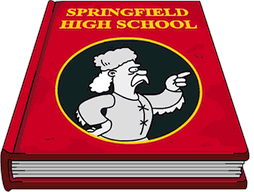 Plans to work these prizes into the design of your Springfield? Sound off in the comments below, you know we love hearing from you! 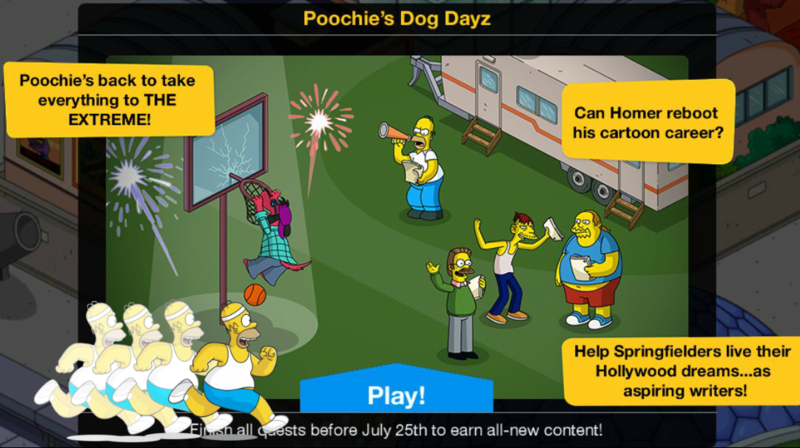 This entry was posted in Poochies Dog Dayz, Tips and Tricks, Updates and tagged How do I get Poochie, how do i get poochies car, Poochie Dog Dayz Questline, Tapped Out Mini Events, Tapped Out Tips and Tricks, The Simpsons Tapped Out, TSTO Addicts, TSTO Itchy and Scratchy Show, TSTO Poochie Dog Dayz Mini Event, TSTO Poochie Event, TSTO Tips and Tricks. Bookmark the permalink. Is there a limit on the number of land tiles we can have in storage? I have reached the free land tile part of this mini-event. All the tasks are done and say done, but it isn’t giving me the land tile and moving on to knew tasks for the last prize. I have 145 land tiles in storage. Is that the limit? Do i have to use one to get this prize one? It’s really my only cheeky complaint that Poochie can’t actually drive his Car around Springfield, or the Theme Parks (Mr. Plow aka Homer Simpson can drive his plow around town, Ned Flanders can take his Kids on a sleigh around town – but over the years we’ve had countless Characters with Cars that haven’t continued doing this? EA got lazy, or ran into some technicals, I guess). I have Poochie and a Disaproving Squirrel …. I guess Scratchy next time at a discount (and yes I’d pay real $ for him, but free Land Token if he comes with a Building). What’s the point. I can’t place one more building or decoration. After playing this game since the beginning and hundreds of levels I just can’t anymore. If the goal of EA is to make long term player quit… good job. The item limits and now another event to get items I don’t have room for. I’m not a farmer. 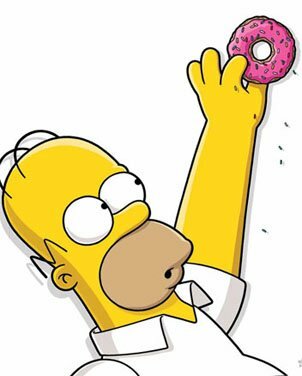 I buy about twenty dollars of donuts a week. They won’t be getting that money from me anymore. Sad. I loved this game. I play on a fire tablet, an iPhone X, an iPad Air 2, and a big beautiful iPad Pro and the game just runs awful across them all. The mini-events are not as important. They come back later if you don’t complete them. Feel free to skip them. I do agree it’s very exhausting one event after the other. I cannot keep up. As well these three part events drag so long I can’t possibly stay focused on them all the time, especially when I have other things in life going on. Try disconnecting the animated rides from The Itchy & Scratchy event. That helped a ton for me. I think they even added an option to turn off the animation on 2 of the rides. 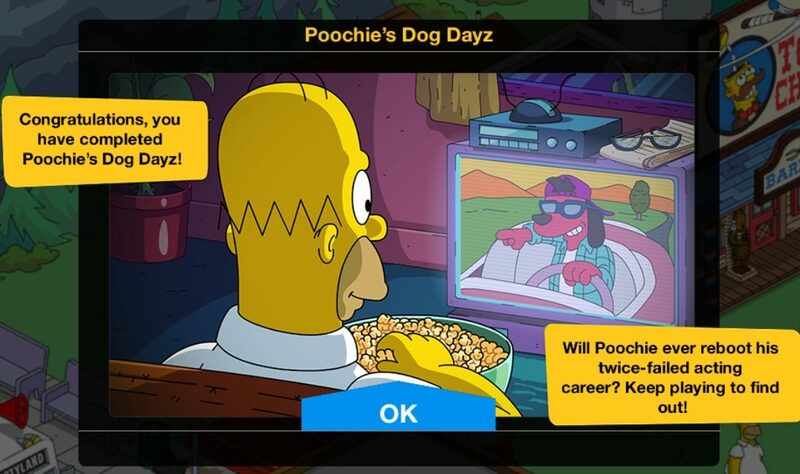 Poochie as a full character? Yes!! I know he’s a stupid one-off but I love what he represents. Incidentally also loved it when he appeared as a boss in the Simpsons game from the Xbox 360. 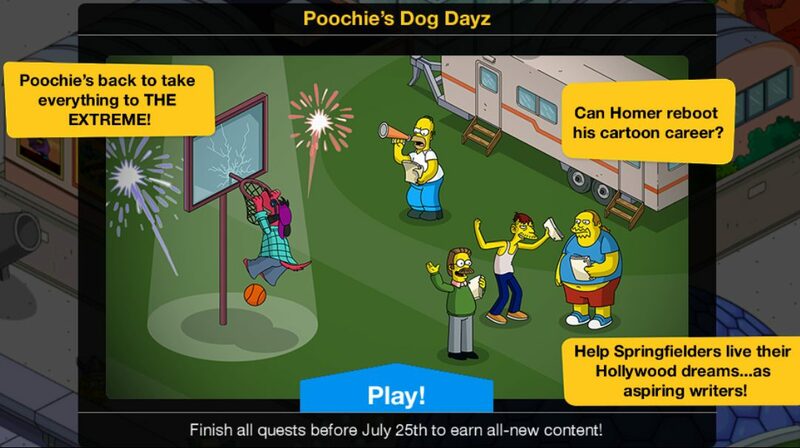 I like that Poochie is a prize and not a crazy expensive premium character like Scratchy. It is great that we finally have a chance to get him as a full character. That was one of my favourite levels in the Simpsons Game because Marge was my favourite character since she could control mobs. I do like seeing elements of the game in TSTO with the music, character quotes, and on a very rare occasion getting something like Sequel Stop and the Chocolate Shoppe from the game in TSTO. I can’t find any info on the disappearing squirrel is she worth donuts.. I have been working with two iOS devices. This morning synced my iPad which means going to your neighbors and then back to your own town and then closing the game. My iPad had the first prize and was working on the second prize since last night which is the trailer. Since I synced the iPad, I moved over to my Iphone and found all the mini event content was gone and I was starting from the beginning. Also all my recycling and other tasks were reset as well. My currency and donuts were OK. Anyone run into this problem? Got a bit of an odd number with the characters i have, 47 scripts per 3 hours, don’t have the time to stagger my characters so might spend some donuts to equal it out. Game is still fighting me ! I have to login every time and then will lose signal. Then repeat process. Almost done , anyone else having issues. It started since the last event. Added a wing to my new network…the kids are having a blast! Thanks, I really like these interactive items for multiple characters…first the Stonecutter’s table, then Moe’s Express and now this. Would love to see more of these, maybe a picnic table for the plant workers or a carousel that the kids could ride? I also love these. Wish I had bought Moe’s Express. Hopefully it will appear again some day. I usually love this kind of stuff, too, but this one feels a bit weird as an outside item. What happens if it starts raining? Or even snowing? There is also the thanksgiving feast table with Flanders and Lisa. Put a boardwalk bench at the end and it looks like 3 people at the table. Does animated job for the audience research table mean you can see kids in the chairs when tasked there? Does Poochie actually drive his car like Lisa’s task for her toy car? That would be great. Yep. Kids show up. Not sure about Poochie…but highly unlikely. Cars apparently don’t have transmissions in TSTO. Some can start and Vroooooom…but don’t move. Might be a special dispensation for religious figures, because the Parson also gets to drive his golf-cart around town. Hmmm, Buddha gets his motorcycle and so does Father Sean. Meanwhile, I’m getting notifications that Park Visitors have overrun my Springfield. And that I should make room for more. Wierd…being haunted by the event that wouldn’t die….👻👻👻. Precursor to the next Halloween Event? Worst case scenario. 47 per 3 hours, which means 37 visits. Visiting 3 times a day it would take 12 days 6 hours, so even if you started today you can finish the quests at a leisurely pace. I have also notice that some ( I think 2) characters get 8 currency instead of 7..
Yeah, Disappointing Squirrel definitely gets 8 instead of 7. She’s the only one I have that does so, but I didn’t pick up Scratchy. Is Disapproving Squirrel a full on premium character? Usually that’s the case, the part won’t show up. If you’ve purchased ALL the characters, you earn 88 every THREE hours. The studio generates 11 every FOUR hours. That equals 99. And you need 200 to earn the first two prizes. And the Currency did NOT carry over. Either stagger your character tasks, or check in every 4 hours and possibly rush one character. I already have Poochie. Do I just get the item?